“He bends his course where twilight reigns sublime. 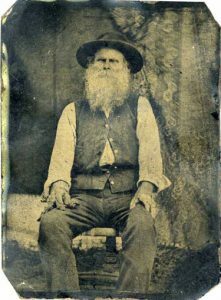 William Divine Claybourn was born on 27 August 1819 in Knoxville, Tennessee, and is the ancestor of the Claybourns originating in Southern Illinois. His progeny now number in the thousands and are spread far over the globe. 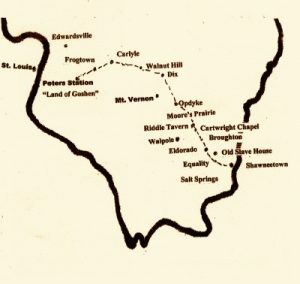 The Claybourn-Hawker “wagon train,” as it was called, crossed the Ohio River by ferry at Shawneetown, Illinois, and the group stayed there for a time. Shawneetown was a lively place with a land office serving a huge domain, a bank, a newspaper, and the first port within Illinois for rafts, flatboats, broadhorns, and the keelboats out of the east. It is possible the family stayed here in order to find permanent land through the land office. The Shawneetown bank built in 1839 still stands and is currently owned by the Illinois Historic Preservation Agency. It was the first bank in Illinois and served as the Bank of Illinois. It is a Greek revival structure constructed of brick, with a limestone front facade, portico, and steps. Repeated floods – particularly a severe flood of the Ohio River in the spring of 1937 – caused the evacuation of the town to a bluff two miles away on higher ground. The bank and other remnants of the wild early village still remain on the old site, although it is no longer open to tours. Frankie’s family, including her parents Reuben and Nancy, made up the other half of the Claybourn-Hawker “wagon train.” The Hawkers were originally from Virginia but lived in DeKalb County, Tennessee, prior to the move to Illinois. The Hawkers and Claybourns were close families. Frankie and her siblings are listed below, although the brothers may have been half-siblings given the gap in birth years. Many of William and Frankie’s descendants bore the names of these siblings. 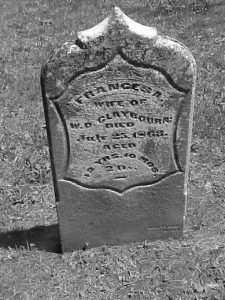 Frances Hawker (“Frankie”), wife of William Divine Claybourn, was born on 23 September 1820 in Tennessee, and died on 25 July 1863, in Jefferson County, Illinois. Mary Polly Hawker was born on 28 August 1821 in Smith County, Tennessee. She married Fountain Garrison (1817-1855) in about 1841 and they had six children together. [Their six children: (1) Elizabeth Tennessee Garrison was born in about 1843 in Jefferson County, Illinois, and married William Davis (born in about 1835 in Ohio) on 3 May 1860 in Jefferson County. 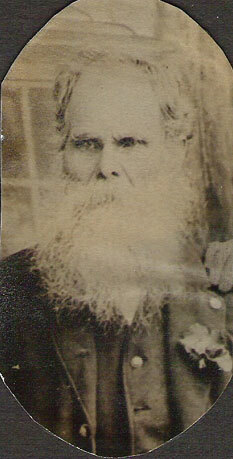 (2) John Crocket Garrison was born in February 1846 in Jefferson County and died there on 26 February 1923. 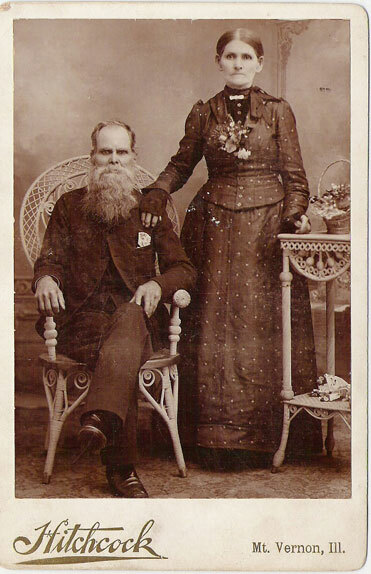 He married Elizabeth T. Meek (1850-1920) on 17 November 1870 in Jefferson County. They had twin daughters Mary C. and Martha C. on 26 September 1871 in Jefferson County. The girls lived with their parents and never married. Mary C. died on 24 February 1924 in Union County, Illinois, and Martha C. died there on 7 August 1928. They are all buried together in Union Chapel Cemetery in Jefferson County. (3) America Fountain Garrison was born on 27 July 1848 in Jefferson County and died on 14 September 1902 in Morgan County, Illinois. She married George Washington Reed (1850-1934) on 10 August 1870 in Jefferson County. They are buried together in Chapin Cemetery in Morgan County. Per the 1900 census, she had given birth to nine children and seven were living. (4) Moses Pleasant Garrison was born on 3 December 1849 in Jefferson County. (5) Louisa Jane Garrison was born on 6 October 1852 in Jefferson County and died on 16 February 1934 in Parke County, Indiana. She married 1st on 1 September 1868 in Jefferson County to Thomas Bennett Short (1849-1898). Per the 1900 census, she had given birth to six children with all of them living. In about 1905 she married 2nd to widower James William Flowers (1849-1931) and lived with him in Lincoln County, Oklahoma, until his death there. She is buried in Wolf Creek Church Cemetery in Parke County as Jane Short Flowers. (6) Virginia Caroline Garrison was born on 23 December 1854 in Jefferson County and died on 8 January 1927 in Pottawatomie County, Oklahoma. 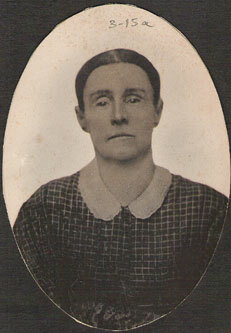 She married William Thomas Osborn (1849-1921) on 20 September 1874 in Jefferson County. They are buried together in Brown Cemetery in Pottawatomie County. Per the 1900 census, she had given birth to six children with only two living, both of whom had moved with them to Oklahoma between 1887 and 1900.] Mary died on 15 June 1878 in Jefferson County, Illinois, and they are both buried in there in Hopewell Cemetery. Reuben Bethel Hawker (“Bethel”) was born on 3 September 1833 in Tennessee. [Bethel Hawker was probably named for the Dr. Bethel of Liberty. It is not a coincidence that one of William Divine’s children was named John Bethel.] During the American Civil War he enlisted in the Union Army with Company E of the 145th Illinois Volunteer Infantry Regiment on 25 May 1864 and served for three months and ten days per the 1890 veterans’ census. Bethel married first to Martha (c. 1840 – c. 1864) on 5 November 1857 in Jefferson County, Illinois, and they had three children. [Bethel and Martha’s children were: (1) Sarah E. Hawker was born in about 1859 in Jefferson County, Illinois. (2) John E. Hawker was born in about 1860 in Jefferson County, Illinois. (3) William Hawker was born in about 1863 in Illinois.] He married second to Sarah A. Hill (c. 1843 – c. 1890) on 5 November 1864 in Macon County, Illinois, and they had two children. [Bethel and Sarah’s children were: (1) James Hawker was born in about 1869 in Missouri. 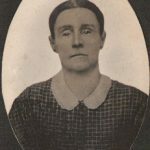 (2) Jane Belle Hawker was born on 24 January 1872 in Missouri and died on 18 July 1940 in Tulsa County, Oklahoma. She married Albert Franklin “Frank” Hunt (1864-1932) on 17 October 1888 in Dade County, Missouri. 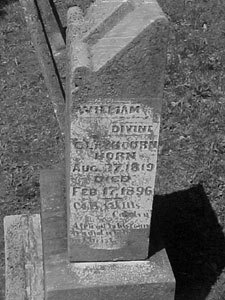 They are buried together in Clinton Oaks Cemetery in Tulsa County.] 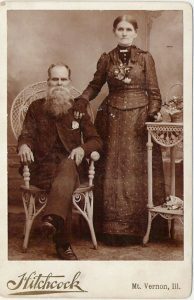 He married third to Martha E. (1846-1907), widow of William N. Sawtell (1832-1892), on 12 April 1896 in Dade County, Missouri. Bethel died on 30 January 1903 in Dade County, Missouri, and is buried there in Rice Cemetery. Not long after their stay in Shawneetown, the Claybourn-Hawker wagon train headed northwest toward Jefferson County, Illinois, via the “Old Goshen Road.” This early road ran from Old Shawneetown to the Goshen Settlement, near Glen Carbon, Illinois. In the early 19th century this was the main east/west road in Illinois. The Goshen Road started as a natural route that was used by Native Americans and migrating animals. Therefore it was not a definite, marked out path. It was, rather, a collection of vague, parallel paths that crossed, shifting with the season and over the years. Jefferson County was settled by American stock of several generations. They were not of foreign birth. A hundred years later, it was still the same. By the mid-20th century in Mt. Vernon there were not more than two or three families of Italian derivation and a family of several Greek brothers. [Claybourn, The Claybourn Family.] The rest were descendants of these early settlers, predominantly Methodists and Baptists from Kentucky and Tennessee. The first settler in Jefferson County was Andrew Moore, who left Goshen in 1810 and traveled east on the Goshen Trail. He eventually arrived at a place about twelve miles southeast of present Mt. Vernon and built a cabin there. This would later be known as Moore’s Prairie, as noted on the map at left. Moore’s cabin was the first Caucasian settlement in Jefferson County, and Moore and his family lived there for several years. He and his son were killed by Native Americans, it is presumed, at their overnight camp on the Big Muddy River as they were returning from a mill. His skull was found some years later by hunters, identified, and buried near the cabin. When he did not return, his wife and the small children tried to find him, learned at the mill in Franklin County that he had started for home, and, after not being able to locate his body, abandoned the lonely cabin and moved to the Saline salt works. The Caseys came next in 1816. Zadok Casey, a prominent Methodist member of Congress from Illinois (1833-1841), began his life in what became Jefferson County with a camp fire beside a massive log in (now) Shiloh Township. When he came, he brought his wife and child on one horse. He walked beside them with his rifle on his shoulder. He had no one to help him build a pole cabin. Later his substantial home, Elm Hill, was built west of Mt. Vernon village on the site of what is now Zadok Casey Middle School. The Maxeys, antecedents of Harriett Maxey Claybourn (James Harrison Claybourn’s second wife), were among the next group of settlers to come. A party of 21 people led by William Maxey, age 48, left Gallatin, Tennessee, on 20 April 1818 and crossed the Ohio River at Cave-in-Rock, and followed the Old Goshen Trail until they reached the Moore cabin, four miles southeast of the present town of Belle Rive. David Crenshaw and Carter Wilkey had moved into Moore’s deserted cabin and farmed in 1816. They were related by marriage to the Maxeys and were there when the Maxey party arrived. They spent the first summer in Moore’s Prarie but were persuaded by Zadok Casey to move up near his settlement that fall, and William Maxey settled on land adjoining Casey to the east. This was about three miles northwest of what is now Mt. Vernon. 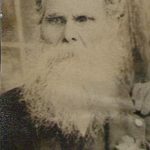 William Maxey acquired the land from the government in 1825, and it remained in possession of the Maxey family for four generations and over 100 years. Illinois became a state and Jefferson County was organized in 1818, with Zadok Casey serving as was one of the Commissioners. William Casey, whose home was where the post office later stood, was the nephew of Zadok Casey. William donated 20 acres of his land to be laid off in lots and sold for the purpose of paying for public buildings in Jefferson County. The town leaders advertised this sale in the Illinois Emigrant in Shawneetown and sent handbills over the county. There were only six families in the Mt. Vernon area at that time, but about 100 persons showed up to buy lots around a little clearing in the woods, staked out with mulberry posts, which was to be the public square surrounding the courthouse. 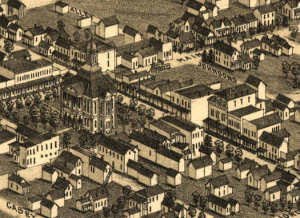 Mount Vernon’s public square as depicted in 1881. Most buildings were destroyed in an 1888 tornado. Bennett Maxey, Harriett Maxey’s grandfather’s brother, bought the first lot for $41. Burchett Maxey, Harriett’s grandfather, built a log house one half block from the present square on the west side of north Tenth Street which served as a tavern as well. He got the contract to build the first jail of hand “hughed” black walnut logs for $320. In 1823 he bought the lot on the southwest corner of 10th and Main, where the First National Bank (formerly Third National) later stood and there built the first home on the public square in Mt. Vernon. The first courthouse was an 18 x 20 foot log building with one door and one window and no fireplace because one was not stipulated in the contract. It cost $85. There it stood in the midst of a great forest, but it was the beginning. Except for the death of Andrew Moore, these pioneers of Jefferson County were not bothered by the Native Americans, although in 1818-19 a group of Delaware Indians passed through the county on their way to western reservations. A party of about 600 camped on Horse Creek for several months in Farrington Township, the area where Harriette Threkeld’s mother was born some sixty years later. Mt. Vernon was officially incorporated on 10 February 1837 with a population of 150. It had 6 stores, three taverns and an inn. On the present North 11th Street, one half block from Main Street and on the west side of the street (just back of the present City Hall), the first church for Mt. Vernon was built. Its original sandstone foundations remained until it was demolished in the 1930’s. 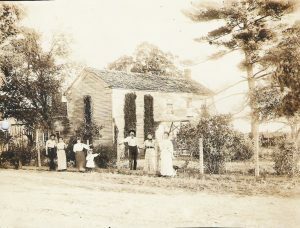 A small church was built for the Methodists in 1834 and enlarged in 1839. The building retained its original architectural lines and had a window in the shape of a cross in the west end. Wrought iron nails were used. Governor Casey presented the church with a bell in 1840 which is believed to be the one used by the United Brethren Church in later days. The principal business in early Mt. Vernon was the gathering of deer skins which were shaved and sent to the market in St. Louis. Mt. Vernon did not become a wagon road center until 1844. In 1830 the population of Jefferson County was 2,555, but by 1840 when the Claybourns came, it had grown to 5,762. It was no longer the wilderness the Maxeys found. In 1850 Mt. Vernon had a population of 300, but more than doubled to 707 by 1860, the beginning of the Civil War. By 1900, Mt. Vernon had 5,216 people and was recovering from the destruction of a tornado that struck in 1888. Historian William Perrin says that William D. Claybourn came in “about 1840” from Tennessee and settled in Field Township, one of the earliest settlers in that area. [William Perrin, History of Jefferson County (Chicago, 1883).] According to family tradition, Catherine, the oldest child of William Divine and Frankie, was probably born in Tennessee before they left. The next child, Sarah, was born at Shawneetown where they stayed a while, probably to find from the land office where they might settle. James H. Claybourn was the first of the family born in Jefferson County, Illinois, on 27 April 1843. If one stands on the road near the railroad tracks and looks north across the bottoms to the wooded bluff, he is looking toward the site. The farm stretches for a mile and a half along the Dix to Divide Road and was cut by the Chicago and Eastern Illinois Railroad when it was built. 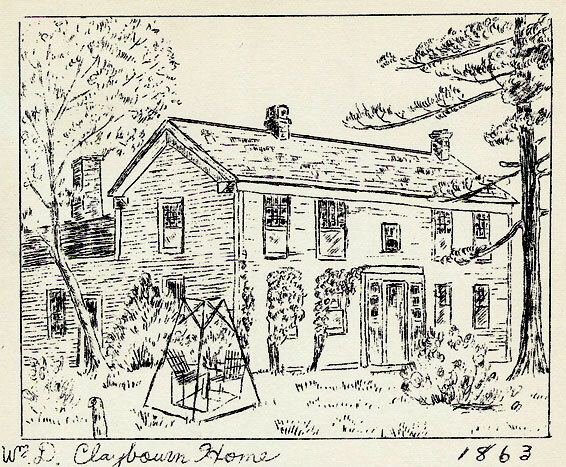 The township was to have been called Claybourn instead of Field, but there was another township in the state by that name. Eula Osborn said she thought the name Texico was made up from initials of different families living in that area. All of the original farm is on the north side of the road. The village is built on the original farm. . . The cabin had two rooms and a loft above where later the boys slept. Later a road was built and the cabin was moved to it. The children attended Beehive School (later called Upper Hawkins). According to Perrin, the first school house built in Field Township was built on Big Muddy on the McCrary farm and was a log cabin that was sixteen feet square with slab seats, puncheon floor and an old time fireplace. [Perrin, History of Jefferson County.] Undoubtedly it was there that James Harrison and the other children received their education. When the family became quite large the two oldest children would carry a bushel basket of lunch between them for the Claybourn kids to eat. Like many men during this era, William served in the Civil War with his children and fought against some southern relatives. He served in Company H of the First Illinois Cavalry Regiment with his oldest son, James H. Claybourn. The group, also known as Noleman’s Cavalry after its captain Robert D. Noleman, was organized at Centralia. 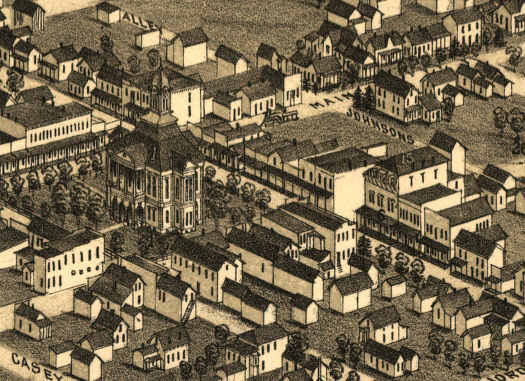 William joined the company on 10 July 1861 at Cairo, Illinois, and was mustered in seven days later on 7 July 1861. Although his term of service lasted only for about one year, he and the company saw a tremendous amount of action and fought valiantly. CAMP LYIN, BIRD’S POINT, MO., October 15, 1861. SIR: Pursuant to orders, I proceeded, with 26 men of my company (Captain Noleman’s Centralia Cavalry), on a scout out upon the Rushes Ridge road, taking a direction towards the Beckwith farm. When mounted rebels, about 100 strong, supposed to be Mississippi or Tennessee Mounted Rifles, armed with breech-loading rifles and revolvers. My advance guard, after giving the usual signal (the enemy continuing to advance), discharged their carbines and fell back upon the column. We were moving down the road through a clearing, the enemy being in the timber. I immediately ordered the advance, and advanced into the open timber, taking a position within 180 yards of where the enemy were forming, and engaged the enemy, who were partly concealed by dense underbrush and heavy timer. The enemy poured a rapid fire upon our position until we were nearly surrounded and our ammunition almost exhausted. We then retired, the enemy following close upon our rear, and engaged my rear guard for about 1 1/2 miles, when the enemy retreated. We brought our wounded men and horses off of the field, with the exception of Corporal H. H. Fletcher, his horse, equipments, and arms. Corporal Fletcher was shot in the temple, some distance in awards discovered still living by Dr. Baker, residing in the vicinity, and by him removed to his residence. Private Louis Krenyhoff received a flesh wound in the arm, the ball passing across the chest and lodging inside the shirt. Several others received slight scotches from shattered balls. The horses of Privates J. Copeland, S. T. Maxy, W. Hutter, and E. T. Amadan were mortally wounded and left on the road. Seven other horses were wounded more or less seriously. The enemy on their retreat stripped Corporal Fletcher of his arms and spurs. Two others lost their carbines. The loss of the enemy, as near as could be ascertained, was from 6 to 10 men either killed or seriously wounded, including the officer in command. Of their horses one was left dead upon the field and others taken off evidently wounded. My men deserve great praise for the coolness, bravery, and implicit obedience to my commands exhibited throughout the engagement, several of whom stood firmly, receiving the fire of the enemy, with by one shot held in reserve, and awaiting my orders. They retired in as good order as circumstances would permit, the rear guard contesting their ground nobly. Poster promoting Company H with a sketch of the cavalry lined up in front of their tents. 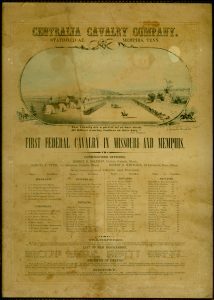 From February to April 1862 the company joined Brigadier General John Pope in the Union effort to take New Madrid, or Kentucky Bend, on the Mississippi River. Their engagements included the Battle of Island Number Ten and the Confederate surrender after that battle at Tiptonville, Tennessee. 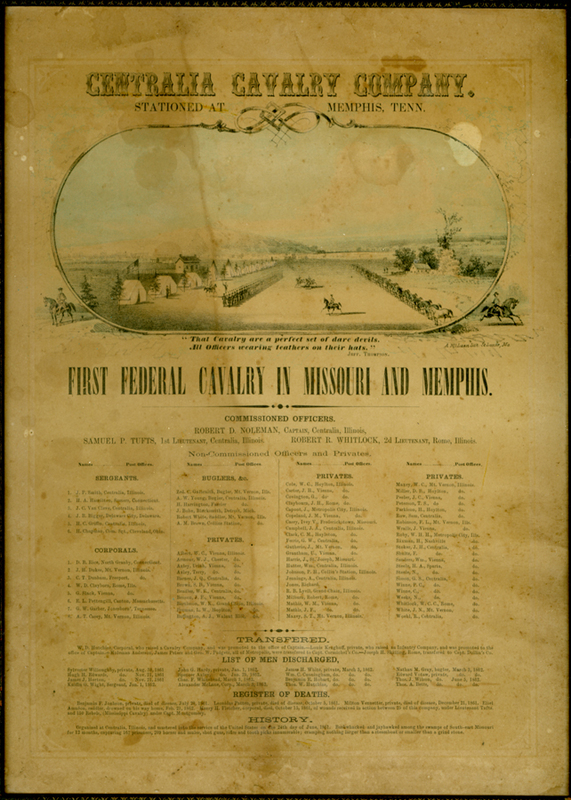 After the fall of New Madrid the company proceeded down the Mississippi River, and in June 1862 they were the first U.S. troops to enter the city of Memphis. In July 1862 they were ordered to St. Louis to be mustered out of service. William was mustered out there as a Corporal on 5 July 1862. After his twelve month stint was over, William did not return to fight in the war. This was not uncommon and, after all, he had a large family at home which needed care. In 1857 the oldest daughter Catherine (called “Kit”) married Joe Boggs, who was killed in the Civil War. The other children were all married after the war. Two of William Divine’s sons, James H. Claybourn and William Pratt Claybourn, served out the remainder of the war in Company H of the 80th Illinois Infantry. The third son, John Bethel Claybourn, served with the 136th Illinois Volunteer Infantry, enlisting when he was 17 in 1863. Still at home were the younger children, four boys and two girls. After the war, in 1866, William’s brother John B. Claiborne and his wife Perlina lived in Jefferson County for a time to live with William. Perhaps John B.’s move to Illinois was motivated in part by the war’s desolation in Arkansas. It may have seemed like a chance to start over. Evidently, though, the stay in Illinois did not in fact turn out to be a happy one and John B. moved back after some time. Harriette Threlkeld believed the unhappiness stemmed from divisive disagreements over the Civil War. After William Divine’s service in the war he returned home and began building what would be known as “The Big House.” But on 25 July 1863, just before work was completed, William’s wife Frankie gave birth to an unnamed infant. Sadly she did not survive the labor, and the child died a couple weeks later. By the time the house was completed it had two stories with two large rooms above and two below. It faced west and was left standing in a field in later years after the road from Dix to Divide was changed and passed along the south boundary of William’s original farm, just as it does today. The northwest room was the sitting room and had a fireplace in the east end. There was a fairly wide hall with a stairway to the second floor, and a large bedroom on the south. A one-story part of the house ran straight back along the north side and contained three rooms, including the dining room and kitchen. Most people entered by the north door from the road running along the north side at that time. 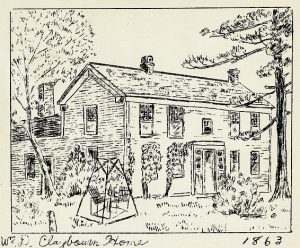 Harriette Threlkeld’s drawing of the house as it would’ve appeared just after construction. “The Big House” after most had moved out. Pictured from left to right is Ellsworth and Ethel C. Hawkins, Sophia and Eula Claybourn, Charles Claybourn, Vada C. (wife of Charles) and Rose Claybourn. The house was built of oak clapboard and cut, most likely, from the farm. The windows were symmetrically placed, and there was an attractive front door with small panes of glass on either side. The kitchen had a large fireplace and wide-board hardwood floors. A porch ran along the south side of the one story part. There were many trees in the yard. Norah Claybourn Hunsinger, a grandchild, recalled attending a surprise birthday celebration for William Divine when she was a young girl at which family and friends gathered. They celebrated outdoors and spread tables in the yard under trees. “Aunt Sally” baked a tiered birthday cake, using a tin cup to bake the last small layer. Norah said she recalled her grandfather very well on that day. He was touched and cried at the tribute to him. This may have been his 65th birthday for in that year, 1884, Sally moved to Kansas. They moved the family organ out into the yard and the crowd sang “God Be With You Till We Meet Again” as they parted. “The Big House” remained standing until the 1930s. William Divine Claybourn and second wife Elizabeth Maxey. This might be their wedding picture. When Frankie died at age 43, she left an infant who would die two weeks later. Also at home were twelve year old Ephraim Smith, the eleven year old twins (Joseph Monroe and Reuben Cicero), seven year old Candace, five year old Vone, and three year old Cashus. A year and a half later, on 15 February 1865, William Divine married Ms. Elizabeth Jennings Starnes Maxey, whose brother Sam married war-widowed Catherine (“Aunt Kit”), William Divine’s oldest child. The Big House was barely big enough for the parents and eleven children (William’s children still at home plus some of Lizzie’s from her prior marriage). Eventually space would get even tighter when William and Lizzie had children of their own. About this time there were eighteen people to sit down to meals three times a day. The three boys who were away in the war married soon after their return. In 2009, Joshua A. Claybourn was contacted by Barbara Wentz, a genealogist who haunts flea markets. In a Kutztown, Penn. flea market she discovered three incredible artifacts relating to William Divine and Lizzie’s family. The first is a Family Bible printed in 1872 with W.D. Claybourn engraved into the leather cover and E.J. Claybourn engraved on the back cover. Inside were pages detailing various family records such as the births, deaths and marriages of William and Lizzie’s family, including Lizzie’s children from her first marriage. These separate family record pages appear to have been older than the Bible itself, and may have been transferred from an even older Bible. Either way, they have provided a valuable opportunity to affirm the dates of certain births, deaths and marriages included in these biographies. The second artifact is a Norfleet family photo album. William and Lizzie’s daughter Lucy Belle married into the Norfleet family, and this album contains numerous photographs of Lucy’s family, as well as some of William and other Claybourn relatives. The third artifact is a wedding album of James Stitt and Dorothy Jewett. Dorothy was a granddaughter of William Lizzy and a daughter of Lucy Belle. Apparently Dorothy and/or her husband moved to a nursing home and parted with most household items. Amazingly, the wedding album had been placed in the trash by house cleaners before being salvaged by antique dealers. All of these artifacts have been invaluable to CGS efforts. Smallness of stature was a Claybourn characteristic, and William was a small man who in adult life always wore a long, full beard. In later years he suffered from a cancer on his lip which was the ultimate cause of his death. His son James accompanied him to Chicago at one time for treatment. All of the family loved to sing, and his granddaughter, Eula Osborn, says that when William was old and sick from the cancer and could not work, he sat on the porch and sang, and one could hear from him clear across the fields. W.D.C.’s headstone at the Jordan Chapel Cemetery in Jefferson Co., Ill.
William is buried at Jordan Chapel Cemetery beside his first wife, Frances Hawker Claybourn. His gravestone bears the words, “A friend of his country, a believer in Christ,” a sentiment also carved on his brother-in-law’s gravestone. About thirty six Claybourns and connections are buried at Jordan Chapel. Lizzie outlived William, and when the big house was sold, she lived in a small house closer to Texico village. During this time she wrote an inscription in the family Bible indicating she had become lonely missing Bill (presumably William Divine), and another about how much she missed Lucy Belle. 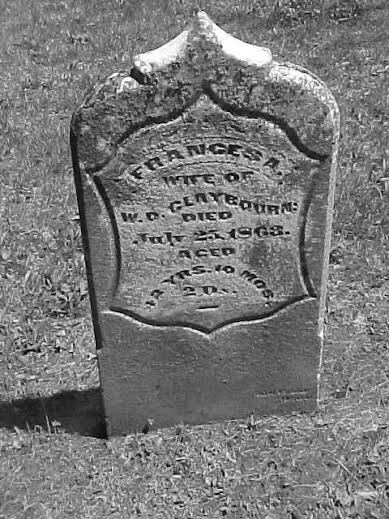 Lizzie died on 11 December 1911 at the age of 83 and was buried at Pleasant Grove beside her first husband. And as “he bent his way,” so did his way bend him. God-fearing and with dignity William labored and carved his place in the wilderness with his hands. He loved his country and fought for it. When his body failed him in all else, he sang. And that, you descendants of William Divine Claybourn, is your heritage: simple, ungarnished, pure and true Americanism. The descendants of William Divine Claybourn now number in the hundreds and are spread far over the country. Of his seventeen children, thirteen grew to maturity. The fourteen children of William and Frances Alla are listed below (click names for separate biographical sketches). Unnamed infant (25 July 1863 – 7 August 1863), preceded in death by its mother two weeks earlier.